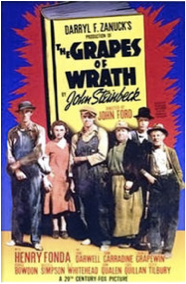 Published in 1939 by John Steinbeck, The Grapes of Wrath is the book that I would like to recommend the most to people who are interested in people living in poverty. What they had gone through may seem to us as obvious facts under the circumstances. However, their feelings, and beliefs under their actions are mostly incredible. This book is about a family, the Joads, moving from Oklahoma to California with full of hopes despite their poor circumstances. However in California, their poverty gets worse and are facing the most unfortunate events. Although his descriptive and meticulous writing can bore readers, it will still engross them with realistic, picturesque images that are provided from those writing. I was most attracted by his generalizations in every two chapters. Also, there are interesting metaphors of the poor families moving to California like the Joads. In addition, the use of slangs effectively captures readers’ attention, and surely I was. The book was also produced into a film, which was regarded as “culturally, historically, or aesthetically significant” by Library of Congress. The film received abundant awards such as best supporting Actress, National board of Reviews of Motion Pictures. Maybe, if I have time, I would like to see the film. I haven’t really watched or interested in old movies, also known as to me as black-white movies. However since I was strongly captivated by the book, I might as well try to watch it and take a risk in watching the black-white movie.